You will never be able to compete with the Big Boys if you don’t train like you’re possessed. To be a champion, you have to lift heavy. To lift heavy you need insane energy. Unless you train with insane energy, you’re just wasting your time. 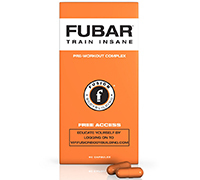 FUBAR™ is the insane energy capsule that you take before hitting the gym. The euphoric blast of energy from FUBAR will get you focused, increase your intensity and help you move the weight you need to get big. FUBAR is the original insane energy supplement created for bodybuilders. You will experience the insane energy you need to lift skull-crushing weight. FUBAR works because it has one purpose only: to give you insane energy. No bells, no whistles – just insane energy like you’ve never felt before. FUBAR will make you the envy of everyone in the gym. How will I feel on FUBAR? 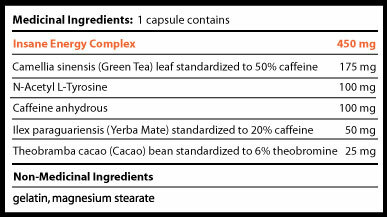 FUBAR will make your energy levels climb steadily within 45 minutes. The rush of insane energy will give you an aggressive focus, so you’ll be possessed to train. When you’re under the bar you’ll be amazed at how easy the weights fly. Rep by rep, you’ll be bigger, stronger, better - and your confidence will soar. FUBAR is so powerful that you’ll feel results from the first dose – without keeping you awake at night. You can. Join the millions of bodybuilders all over the world who use FUBAR to dominate the competition. How do I use FUBAR? It’s easy. Simply take 2 capsules of FUBAR 45 minutes before you hit the gym. Take 1-2 capsules of FUBAR 30 minutes before you hit the gym. CAUTION: For adult use only. Not for use by children, teenagers, pregnant or lactating women. If you are under medical supervision, consult with your physician before use. Do not mix FUBAR with alcohol.